In November the fish can be as unpredictable as the weather, winds and tides. November is the opposite of March. What I mean by that is, all the fish that move into your spots in March are now the same fish leaving your spots in November. I find November to be a month on the move. It’s one of those times of the year when fish are transitioning front point A to point B to get settled in for the winter. As the weather gets cooler and the wind picks up either holding the tide in or pushing the tide out, it gets harder and harder to predict where the fish are going to be from day to day. The story of our inland waters becomes a story of , “that was then this is now”. The whole deck of cards gets reshuffled. It’s the time of the year when guides make the most famous statement to their clients known to the charter business which is “sorry the bites slow today, you should have been here yesterday, and tomorrow will be better”. Because yesterday and the day before that guide put his clients on 30 redfish, 20 snook, 20 trout, a cobia, and a kingfish. Today because the wind is blowing in the opposite direction, the winds picked up 10 knots more, it becomes over cast, and the temp drops 5 degrees, all those fish that were there are gone and the guide can’t find them now. A day of fishing in November, can either the best day or the worst. Here is some tips for finding the fish in November. Look for the birds: Many times when the birds are flocking and feeding over bait fish, it’s because the game fish are schooled up and feeding under the bait, pushing and keeping the bait at the surface. 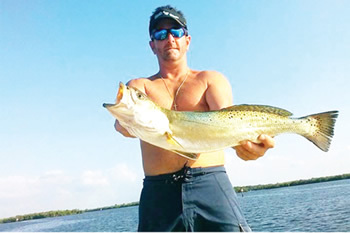 Redfish, snook and trout are running with the jacks, lady fish and bluefish inshore in November. It’s not rare to see huge flocks of birds on big pods of bait. If you follow that the pod down the bank you should have success. Follow the flow: In November when the tide goes slack the bite shuts down. You must find moving water. Slack low or peak high is the time to pull anchor and make your move and travel to your next ambush spot, a spot where moving water is happening or about to happen. Chum a lot: Since the game fish are on the move transitioning from one haunt to the next, you need to get their attention, stop them, and keep them in the spot you’re fishing. Remember when chumming bait fish such as greenbacks and/or thread fins, look for seagulls before you chum. If the gulls are hanging around your boat it’s because those gulls have been educated enough to know a boat means food. If gulls are lurking don’t make the mistake of throwing out a bat full of crippled bait because the gulls will dive on the baits, casting shadows on the flats, and spook your game fish. If there are gulls around keep your chum baits natural and dribble them around your boat so the gulls don’t have the opportunity to dive bomb you on your spot.